3 large beets, tossed in oil and roasted at 350 until soft all the way through. This will at least 25 minutes. Stick a paring knife into the beet and if it goes in and goes out easily then they should be ready. Cool them on another plate. After beets are cool. Peel them using a paring knife. Gloves are preferred, beets make everything pink! Dice the beets medium dice and reserve in a small bowl. Toss with olive oil, walnuts and lemon zest. Combine the lettuce and herbs in a salad bowl. In a mini food processor, pulse together the shallot, mustard, vinegar, lemon juice, zest and cayenne. Add the olive oil and pulse again to combine. Add the sour cream and blend for 30 seconds until creamy. Taste and season with salt and pepper. Drizzle over the greens and toss to coat and serve. 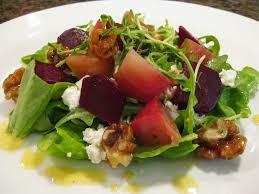 Place the dressed greens in a serving bowl and put the beet and walnuts on top. Garnish with goat cheese and enjoy.